TRIVIA: Seoul has 25 districts (gu) that are further subdivided into 522 sub-districts (dong), and with the Han River that runs through the middle of the city, there are distinct 2 sections: Gangbuk (northern area that’s more traditional) and Gangnam (southern area that’s more modern). But… asking for the “center” of this whole metropolitan area is a difficult thing to answer because Seoul’s districts can somehow each function like a city center itself. It actually baffles me that I didn’t go to Seoul sooner; nevertheless, the important things is, I’ve finally seen this city for myself and well… I just LOVED it! I am totally smitten about how it is constantly brimming with incredible things-to-do of sorts — all of which are enough to satisfy any kind of traveler out there. Clearly, the days I spent there were not enough and I would have absolutely loved to stay longer. And now, as I recall the vast array of activities and sights that could be done and seen, I’ve now decided to whip up this comprehensive Seoul itinerary travel guide that spans for 5 days/nights to help travelers (like you) to plan their trip with ease and speed. Rest assured, the itinerary below is totally customizable to fit any number of days that you might be spending. What is the currency in South Korea? South Korean Won (KRW / ₩) wherein KRW 1,000 is equal to about USD $0.9~, €0.7~ or Php 49.00~ (this is as of May 2018). In the event that you want to exchange your money to KRW, I highly advice that you do NOT exchange your money at the airport since the rates there are not competitive. So what should you rather do? Either exchange your money at a bank or at a money exchanger in your home country or in Seoul’s city center. Better yet, just withdraw from an ATM with your debit/credit card (do one big withdrawal to minimize fees with your bank). Speaking of cards, a lot of Seoul’s establishments accept credit cards but it’s always advisable to have cash on hand. When is the best time to visit Seoul in South Korea? ADDITIONAL TIP: Arrive and start your Seoul itinerary before the weekend. Example, if you’re visiting for 5 nights, make sure to come from Wednesday to Sunday. I say this because most places, museums, and shops close on Mondays and Tuesdays. Moreover, a lot of cosmetic stores hold sales starting on Thursdays and up to the weekend. How to get to Seoul? International visitors typically arrive at the main airport called as Incheon International Airport (ICN). To get here, I recommend browsing through Skyscanner to find the best flight deals from your point of origin. If you’re from the Philippines like me, Skyscanner also scans through the budget airlines such as Air Asia and Cebu Pacific in order to find which of the 2 has the cheapest rate on the dates you choose. By train. AREX (Airport Railroad Express) or ‘airport train’ connects ICN to Seoul station and Gimpo Airport, operating from 5:20AM to 12:00AM (midnight). There are 2 types of AREX, namely ‘express’ and ‘all-stop’. As the name suggests, ‘express’ is fast as it goes directly to Seoul Station (43 minutes) whereas ‘all-stop’ will arrive at 12 stations before finally arriving at Seoul Station (53 minutes). ‘Express’ tickets typically cost ₩8,000 but if you purchase through KKday, you can get it at a discount for about ₩6,500~ only. Contrarily, in case you hold a Discover Seoul Pass, you can avail one (1) FREE one-way ride. By private transfers. If you want utmost convenience and ease, especially without having to drag your luggage around, I recommend booking a private transfer to your hotel for only $63~ (or Php 3,300~ / ₩67,000~). This works best if you’re coming together with other people so that you can share the cost and save more. Otherwise, there are taxis at the airport that charge around ₩60,000 to ₩90,000 depending on your destination (take note that if the taxi passes by a road toll, you’ll have to pay for it). By airport limousine/bus. These limousine buses travel directly to major areas and big hotels in Seoul and are a great option when you’re traveling with a lot of luggage. To get a discounted rate on this at about ₩14,000~ only, book here. How can I go around Seoul? I would recommend using Naver Map (iOs / Android) for researching your day-to-day route because it will show in detail the fastest connections you can do (by walking, by car, by bus, and by subway). To make this work, get your own pocket WiFi or SIM Card (use promo code IAMAILEEN to get 10% off on the SIM Card) to stay connected online. You might be wondering why I am not recommending Google Maps which is the app that I typically use in my travels. Well… this is because Google Maps’ driving and walking directions don’t work in South Korea. This is mainly due to the country’s old security laws that were set after the Korean War (I guess, as a way to protect their detailed topography from North Korea). By subway. Seoul’s metro is impressive, well-connected and cheap. To save time and make the most of the fares during your stay, it’s best to buy a T-Money card which is basically a stored value smart card that you can recharge and use between buses, train and subways while saving you ₩100 on all trips. If you’re from the Philippines, you can buy this online beforehand and have it delivered to your doorstep before your trip — otherwise, it can be purchased at most of Seoul’s subway stations, newspaper kiosks, and convenience stores. However, if I may give you a tip, you can actually avoid paying the cost of acquiring this card (₩3,000) if you have a Discover Seoul Pass (which I will discuss in the next section below). NOTE: Single-ride cards cost about ₩1,200~ and they can be purchased on vending machines which accept coins and bills only. Reloading your T-Money Card can also only be done with cash. Meanwhile, remember that the last train usually departs by midnight (the subway does NOT operate for 24 hours). By bus. The city also has an extensive and well-connected bus service that similarly makes use of the T-Money card. Just always remember to tap your card before exiting the bus or else you’ll be charged the maximum fare possible on that bus’ route. If you’re rather looking for an unlimited hop-on-hop-off bus to the city’s major spots, you can check this out. By foot. Seoul technically isn’t too huge of a place and most of the city highlights can be reached by foot. By taxi. There are various taxi types in Seoul and in order to learn more about them and their corresponding fares, read here. What are money-saving tips I should know of in order to get FREE or discounted activities in Seoul? T-Money function: As I’ve discussed previously, if you get a Discover Seoul Pass, you’ll save on the ₩3,000 cost of buying a separate T-Money card because the pass already has this function. Plus, even if this pass’ validity period has expired, you can still use it as a T-money card for buses, subway and taxis. You only need to load it, and if you don’t use all of that load, you can refund the balance. (From my whole 5-day trip, I think I only spent ₩20,000 or Php 900~ with my T-Money card, so you can use that as a basis for your initial top up). NO WORRIES! Using your Discover Seoul Pass as a T-Money card for public transportation does NOT activate it. The Discover Seoul Pass will only activate when you first use it on its listed attractions. To get the best rate for a Discover Seoul Pass, you can purchase it online (it’s available in 24H and 48H options), and then pick it up either at Incheon International Airport or at Myeongdong’s Tourist Information Center. TIP: The last Wednesday of each month has been designated as a “Culture Day” in Korea since 2014. During this day, participating museums, galleries and other cultural facilities will offer FREE or discounted admissions. Examples are the royal palaces, Jongmyo Shrine, National Museum of Korea, Korean National Ballet etc. How is the internet connection in Seoul? South Korea is said to have the fastest internet in the world (and yep, it’s true!) so you’ll be assured of great connection wherever you go. To add, most places even offer FREE WiFi — but in order to consistently stay connected online during your Seoul trip, get your own pocket WiFi or SIM Card. Should I get a visa to visit Seoul? Take note that the 5-day Seoul itinerary below does not take into account your arrival day in Seoul — at any rate, if you’re staying longer in the city, you can make use of the last tab called as ‘Extras‘ to see the other activities or trips you can do for filling up the rest of your vacation days. TIP: It’s best to arrive and start your Seoul itinerary trip before the weekend. So for example, if you have 5 whole days, make sure to arrive on Tuesday and then start your whole tour from Wednesday to Sunday. I say this because most places, museums, and shops close on Mondays and Tuesdays. Moreover, a lot of cosmetic stores hold sales starting on Thursdays and up to the weekend so it would be a good idea to take advantage of that. NOTE: The following section is in a tabbed format; so, in order to see the next day’s contents, just click the headings below. Explore palaces and enjoy Korean culture in a hanbok! (Nearest subway station: Gyeongbokgung Station, Exit #4) You must never leave the city without trying on the elegant Korean traditional clothing called as ‘hanbok’! Much like how Japan has kimono rental shops, South Korea has hanbok rental shops for tourists. Through these places, you can borrow and wear a hanbok for a day (or more) whilst you venture out to the cultural spots in Seoul to snap wonderful photos. This is certainly a MUST-do activity in your Seoul itinerary because aside from the fact that you can have the chance to feel as though you’ve been transported back to the Joseon period or to a set of an old K-drama, the experience itself is also supported by the Koreans as a part of promoting their history (so yes, it’s one way of immersing yourself with their vibrant culture too). And if those reasons are not enough, wearing a hanbok grants you FREE entry to the palaces in the city! TRIVIA: The term ‘hanbok’ literally means “Korean clothing” but it just basically refers to the traditional clothing for both men and women from the Joseon period. There are a LOT of hanbok rental shops in Seoul but if you want the best, I highly recommend renting with Seohwa Hanbok. Apart from its prime location, it has more intricately-designed hanbok garments that are set at an affordable price! For a more comprehensive guide on this, read my ‘Hanbok Rental‘ post here. Now, as you would see on the online booking platform, Seohwa Hanbok has 3 rental options: 6 hours, 1 day or 2 days. Between the 6 hours and 1 day package, I suggest getting the 6-hour rental because there isn’t much of a difference from the 1-day pack (where you need to return the hanbok at the closing time of 7PM) . After all, the shop is generous enough in adjusting the start time of your rental if, let’s say, you came in late or you took a while choosing your hanbok attire. Example: You set an appointment at 9AM but you come in at 9:30AM and only finished fitting your hanbok and arranging your hair at 10:30AM. Seohwa Hanbok will then be kind enough to re-adjust and make your start time at 10:30AM and end time at 4:30PM. This leaves you with enough time to explore some other places in the day — BUT please, I’m NOT telling you to be late! Besides, if you arrive earlier, you’ll have more hanbok designs to choose from and there won’t be too much of a crowd yet either. NOTE: If you have purchased the Discover Seoul Pass (no matter if it’s the 24H or 48H option), it’s preferable that you do NOT activate it on this day because you’ll already be given FREE entry to 4 of the ‘Five Grand Palaces’ if you’re wearing a hanbok. Not to mention that this whole hanbok activity will already likely fill up your whole day, so it’s best to activate the pass the next day. (Unless of course, you plan to avail the FREE hanbok rental use instead that’s under the Discover Seoul Pass’ perks. Personally, I think it’s best that you avail a hanbok rental separately for longer hours because the free hanbok rental under the pass is only for 90 minutes). Visit one (1) of the ‘Five Grand Palaces’: The following 5 structures are considered as exemplary works from the old Joseon period and each of these magnificent palaces is truly a sight to be seen. However, if you ask me, Gyeongbokgung and Changdeokgung are the best of the five — so, you can choose from either of these two for your visit (or if you are fast and can squeeze in some time, then doing both will be optimal). ★ Gyeongbokgung: This is the closest palace from Seohwa Hanbok (it’s just a few steps away) and if you can only go to one palace during your Seoul trip, I propose going here because it is the main royal palace and also the largest of the 5 (even often called as the most beautiful too). The Changing of the Royal Guard (Sumunjang) ceremony is held for FREE daily, except Tuesdays, at 10:00AM and 2:00PM in front of Gwanghwamun or the main gate of Gyeongbokgung. If you can’t make it to these time slots, you can also witness a Guard-on-Duty Performance in Gwanghwamun gate at 11:00AM and 1:00PM or a Sumungun (Gatekeeper) Military Training in Hyeopsaengmun Gate at 09:35AM and 1:35PM. ★ Changdeokgung: This was the 2nd palace that was built after Gyeongbokgung and it has since been recognized as a World Cultural Heritage site by UNESCO in 1997. An interesting feature of this place is its ‘Secret Garden’ because there are only a limited number of admission slots per day that are given out. If you’re lucky, you can get the chance to go in if you want to! Deoksugung: This palace is famous for its picturesque stone-walled road (which is often featured in K-dramas like Goblin). And much like Gyeongbokgung, Deoksugung Palace has a Changing of the Royal Guards Ceremony and it is held at 11:00AM, 2:00PM, and 3:30PM daily, except on Mondays. Changgyeonggung: This used to be the residential quarters for queens and concubines of the king, and it later became a park with a zoo and a botanical garden during the Japanese colonial rule (today though, the zoo and garden are relocated to Seoul Land). Gyeonghuigung: Located near Deoksugung Palace, this site served as the secondary palace for the king in the latter half of the Joseon period. For a time, Gyeonghuigung was of a considerable size but most of its major structures have long been disassembled and moved to other parts of Seoul. Not too far away from Gyeongbokgung and Changdeokgung palaces is this village that is home to hundreds of traditional Korean houses or ‘hanok’ that date back to the Joseon Dynasty. With this in mind, this makes for a great place to visit with your hanbok attire. To get here, look for the Bukchon-ro street. It will be hard to miss because the tourism board had recently appointed staff there in red clothing to help tourists and distribute maps. Basically, there are 8 major view points to see in Bukchon Hanok Village and those that you must NOT miss are the Gaehoe-dong areas that are typically appointed as Views #3 to #7. If you’re coming with elderly companions, take note that there are a bit of uphill climbs in this area. Unlike other hanok villages (like Namsangol Hanok Village), Bukchon was not built for tourists as it is rather a residential village inhabited by Seoulites. Therefore, make sure to keep quiet so as not to disturb the locals. As you leave Bukchon, drop by the nearby neighborhood of Ikseon-dong. Much like Bukchon, it’s one of the oldest hanok villages in Seoul; but in case you want to escape the crowds, it would be a great idea to explore this hidden gem! As you make your way to the last stop of this route, you must not skip on the neigborhood of Insa-dong in the Jongno-gu district of Seoul. After all, its streets are one of the best places in Seoul when it comes to culture and crafts (perfect for souvenirs!). If I may also share another tip, try to stop by Ssamziegil which is a unique building wherein each of its levels are connected in the form of a spiraling walkway! Lunch: You can either have it at Bukchon Hanok Village or at Insa-dong. There are a lot of cafes and restaurants in these areas so you won’t have a difficult time picking a place; though if I may put in my two cents, do check out Jokagbo at Bukchon (across the street near the entrance to the village) or Gogung at Insa-dong for their bibimbap (mixed rice bowl). For other food or restaurant options, click the “Extras” tab on top of this section. Located at the foot of Namsan, this village was built to feature 5 traditional houses of different social classes from the Joseon era, all relocated to this spot from different locations in Seoul in order for guests to understand the daily lives of its past people. Of all these 5 houses or hanok, only one is open to the public which is the house of Yoon-ssi of Okin-dong. It has been transformed into ‘Yoon’s Tearoom’ where visitors can learn about Korea’s tea culture. If you’re interested, you could join the tea ceremony program for only ₩7,000. (For a list of other activities in this village, see this link). Is it possible to just try on a hanbok for FREE? Yes. If you hold a Discover Seoul Pass, you can wear a hanbok of your choice outdoors for 90 minutes via HANBOKNAM, or take photos with a hanbok in the indoor studio of Namsan Seoul Tower Hanbok Experience Center. However, if you do not have a Discover Seoul Pass, Korea Tourism Office’s Main HQ allows you to wear simple hanbok and take shots of yourself in it indoors. 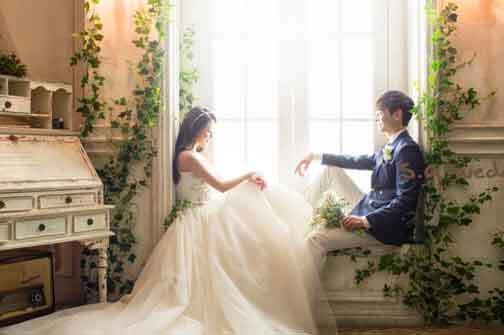 Is there a service where I can just rent a hanbok indoors and have a professional photographer take photos of me? Of course! You can book this kind of experience via KKday for just ₩15,000~ (or USD$14~ / Php 730~). It even has the option of doing outdoor shots. Also called as “DDP”, this structure is a new major urban landmark in the heart of Seoul which has a distinct futuristic design made by world-renowned architect, Zaha Hadid. As such, it’s not strange that it is one of the most Instagrammed locations in Korea. 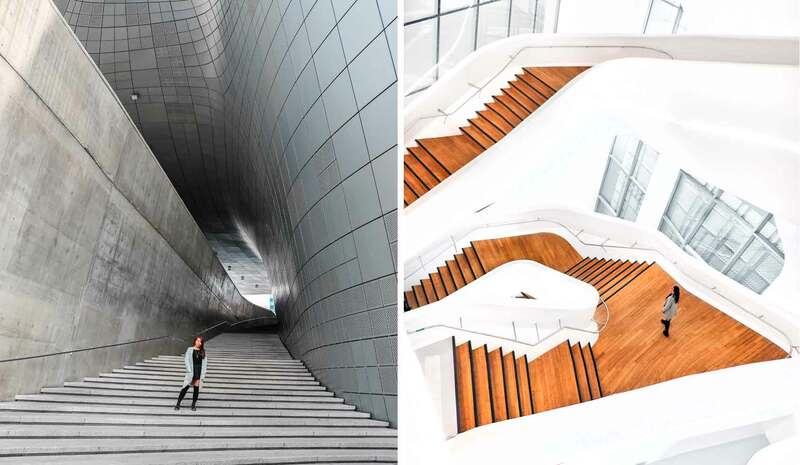 Other than enjoying its grand outer architecture, you can also stroll through DDP’s huge 5 halls namely, Art Hall, Museum, Design Lab, Design Market, and Dongdaemun History and Culture Park — places where you can shop and watch various exhibitions, fashion shows, and performances among many others. From late May to late October every year, Seoul Bamdokkaebi (Goblin) Night Market will open in DDP from 6:00PM to 11:00PM, so don’t forget to make a stop here to not only buy a variety of food and goods, but to also enjoy the various performances made available during this event. Make sure to drop by DDP’s LED Rose Garden which is a permanent exhibition of 25,550 roses that will light up automatically once the sun sets. To get there, just go to side of Yigansumun Exhibition Hall or simply ask the DDP guards or attendants for directions. TRIVIA: This display was first put up on National Liberation Day in 2015 which is in celebration of Korea’s 70th year of independence. Hence, the number of 25,550 comes from 365 days multiplied by 70. BONUS: If you still have some time, drop by Ihwa Mural Village, a picturesque neighborhood in Seoul that is famous for its amazing murals — as well as for its fascinating cafes and shops. It’s no wonder that a lot of K-dramas and movies have started to do their filming here. You can basically find this near Naksan Park (which also yet another hidden gem that provides great views of the cityscape). Like I’ve written above, this night market opens from May to October. 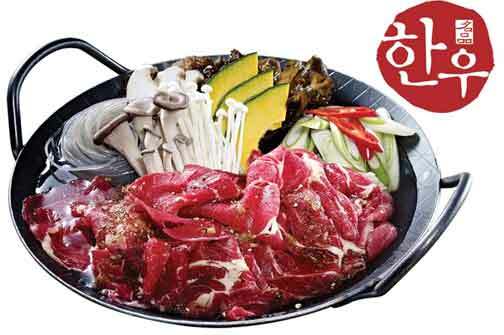 It originally opened in Yeouido (Yeouinaru Station, Exit #3) but has since expanded to several locations such as DDP. The other remaining places would be Cheonggyecheon Stream (Jongno5(0)ga Station, Exit #7) and Banpo Hangang Park (Express Bus Terminal Station). Take note that this is different from the night market found in DDP. Apart from the retail haven found in this vicinity, you will also find the ‘Open market’ with its bright yellow tents, all selling various apparels, souvenirs and items at affordable prices starting from 10:00PM up to 5:00AM. If you’re rather looking for delicious Korean eats, drop by Mukja Golmok (“Let’s Eat Alley” at exit #8 of Dongdaemun Station) to feast on snacks like tteokbokki (rice rolls). Even if this is not one of those ‘traditional’ night markets, it remains to be a popular destination for travelers as it is set in the bustling shopping district of Myeongdong that holds some of the biggest stores like Lotte and Shinsegae as well as cosmetic brands of all kinds. Starting from 5:00PM and onwards, you will start to see food stalls filling up the main street with fares like gyerangbbang (Korean egg bread), dak-galbi (spicy stir fried chicken), etc. Open from 11:00PM till 4:00AM, this traditional night market is the largest in Seoul and it holds every possible thing that you can think of — from food to clothing, they have it all! If Namdaemun is the largest, then Gwangjang would be the oldest in Seoul, making it a common go-to place for many Korean shoppers. You can actually find this close by Dongdaemun and DDP so it’s possible to check off several of those night markets in the same night if you will it so! (TIP: This place is best if you’re looking to buy a hanbok for yourself). Operating 24 hours a day, this place is more than just a night market. If you come in the early morning, you can witness a bustling fish auction (reminiscent of Japan’s Tsukiji Fish Market). Anyhow, the fun part about this place is that you can buy some fresh seafood and then have it cooked by a restaurant located on the 2nd floor — and if you’re brave enough, maybe you can try the infamous Korean activity of eating a LIVE octopus? 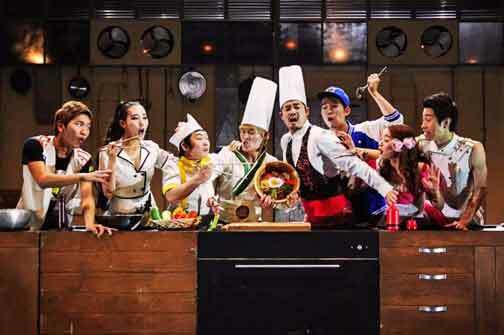 If there’s one show that you should NOT miss for your Seoul itinerary, it will be witnessing the award-winning long-running NANTA Show at Myeongdong Theatre. This is basically a non-verbal comedy show (so it’s fine even if you don’t know Korean) that incorporates traditional ‘samul nori‘ rhythm (which is a genre of percussion music distinct to Korea) as they do a slapstick play that mimes the story of cooks who are preparing for a wedding. I’ve seen this show myself and it was quite entertaining as I saw knives fly and fire blasting from pots — but don’t worry, it’s all safe! But I must say that it did have a distinct sense of humor that may or may not work for you. Either way, it’s an energetic performance which has garnered distinctions and awards from Edinburg Fringe Festival and on New York’s Broadway, so I say: give it a try! NOTE: If you have purchased the Discover Seoul Pass (no matter if it’s the 24H or 48H option), this would be a good day to start its activation. This is is arguably the shopping mecca of Seoul and its 2 main streets meet in the center — the first spanning from Myeongdong Subway Station and the second from Lotte Department Store at Euljiro. For the shopaholics, there is a wide range of branded shops and department stores that line Myeongdong’s streets and alleys (e.g. Lotte Department Store, Shinsegae Department Store, Noon Square, etc. ), and they are often set relatively cheaper than the other shopping areas in the city like Cheongdam-dong. Of course, let’s not forget that Myeongdong is a beauty-lover’s dream too given the number of Korean cosmetic stores that regularly hold insane sales for their high-quality products. As an example, I went here to shop for face masks and one piece averaged at only USD$0.40~ or Php 20~! Some of the top stores you need to check are: Innisfree, Nature Republic, Holika Holika, Tony Moly, Nature Republic, and Laneige. (If you have heard of the Instagram-famous place called as Style Nanda Pink Hotel, you can find it here in this neighborhood or ‘dong’). TIP: Try to NOT buy from the first shop that you set foot into because most of the time, they will hand out free samples and masks, which could be quite a treat! In fact, I know that some people would hop from store to store just to collect samples, haha. Anyhow, in case you want to check out other places because you’ve got some time, shops in Hyehwa and Sincheon neighborhoods can have cheaper cosmetic products too. And oh, of course, do NOT ever forget claiming your tax refund! Hongdae Free Market: Open on Saturdays from March to November at Hongik Children’s Park. You will find here an array of local artist works. Trickeye and Ice Museum: TrickEye museum is an interactive 3D space that gives off impressive optical illusions; whereas Ice Museum, as the name implies, is a space where you can enjoy a cool icy environment (e.g. a living room with a TV and couch made of ice and more). Entering to these places are free if you hold a Discover Seoul Pass, but if you don’t have the pass, you can reserve your tickets online via KKday. 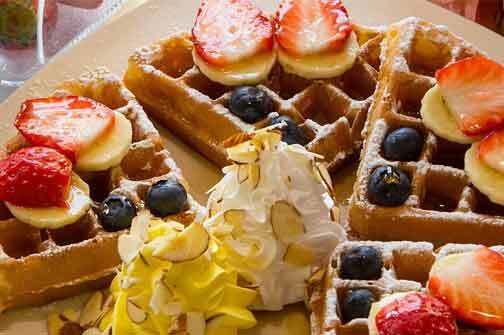 If you’re looking to spend some time in cute cafe’s, go to ‘Chuu‘ or ‘Zapangi’. BONUS: Ewha Womans University is an educational institute with picturesque grounds, but more than this, it’s actually smacked in a shopping area that sells a variety of affordable and stylish clothes for young people; therefore, this is also a good place to shop. It’s time to feast on a delicious Korean BBQ meal! 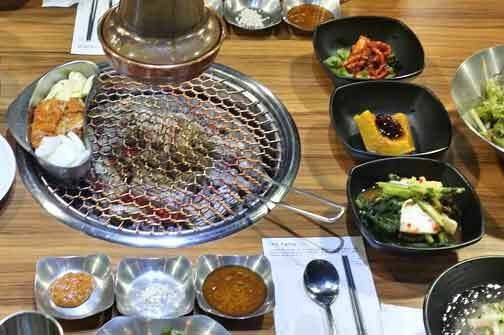 While you’re already in Hongdae, go and have it at Samgeori Pujutgan — a place well known for its high-quality meat and secret sauces. For other food or restaurant options, click the “Extras” tab on top of this section. If you’ve followed my advise and got yourself a Discover Seoul Pass, you can enter any of the establishments below for FREE! Take your pick from any of the following to fill up the rest of your day (best to pick 2 at most). For a complete list of FREE admissions under the Discover Seoul Pass, you can also visit this page. 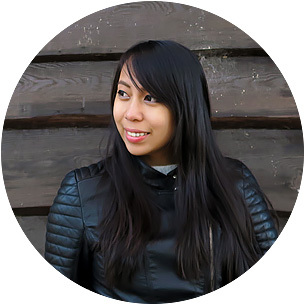 Are you a fan of K-pop, K-dramas, or Korean stars — or just ‘hallyu‘ (Korean Wave) in general? Then MBC World is a great destination for your Seoul itinerary, as it will give you the chance to experience hologram K-pop concerts, virtual reality drama sets and more. (If you don’t have the Discover Seoul Pass and want to separately book a ticket, go here). Still in line with the ‘hallyu’ fever, this place is dedicated to famous K-pop artists under the powerhouse of SM Entertainment in South Korea. Avid fans can tour through their training rooms, recording rooms, and so much more. (If you don’t have the pass and want to separately book a ticket for this, go here). This is like Korea’s version of Madam Tussauds. You can find about 80 wax figures of Korean and international celebrities, as well as several thematic interactive experiences. (If you don’t have the pass and want to separately book a ticket, go here). Other than gaining access to panoramic views of Seoul, you can also enter in 63 Square the first aquarium in Korea called as Aqua Planet 63. If you’re a K-drama fan, this is actually the aquarium used in ‘Legend of the Blue Sea’ and where a Mermaid Show is regularly held. (If you don’t have the pass and want to separately book a ticket, go here for the aquarium or here for the observatory. You can also book a romantic lunch or dinner on top of the 63 building). This place has the largest collection of marine life in Korea and you can watch feeding shows and interactive exhibits here too. (If you don’t have the pass and want to separately book a ticket, go here). Seoul City Tour Double-Decker Bus: Go on a hop-on-hop-off bus tour through the center of Seoul to get a glimpse of all of its past and present glory. (If you don’t have the pass and want to separately book a ticket, go here). This place is similar with TrickEye Museum but it is arguably larger with several other exhibits such as the ‘Dynamic Maze’ (where participants must work together to overcome challenges) and the ‘Black Wonderland’ (where fairy tales like Alice in Wonderland, Frozen, Cinderella and Aladdin can be experienced in the dark). (If you don’t have the pass and want to separately book a ticket, go here). Seoul Zoo is South Korea’s largest zoo with over 330 species of animals, inclusive of a botanical garden and a forest park. The icing to the cake? You can even ride the Sky Lift which can transport you to several places such as the Seoul Land theme park and more. (If you don’t have the pass and want to separately book a ticket, go here). Do you want to be a part of Korea’s popular variety show, Running Man? Well with this thematic experience, you can do so! This will surely be a hilarious and fun adventure for you and your travel companions as you make your way through 6 zones, including Maze Battle. (If you don’t have the pass and want to separately book a ticket, go here). (Take Namsan Shuttle Bus, Circulation Bus No. 2, 3, or 5). Mt. Namsan’s Namsan Park is a symbolic place in the center of Seoul. To get up here, you can ride a cable car, a bus, or just simply walk up its stairway path. Most visitors come to this place to enjoy the nature, to see the city skyline or to do some of the hiking trails — but a majority makes a stop to the famous N Seoul Tower which is the first tower-type tourism spot in South Korea. Rising at almost 480m above sea level, it is certainly one of the tallest towers in Asia. Once you set foot in its premises, you can explore its other attractions such as the LED tunnel, Hello Kitty Island, Ssentoy Museum & Showroom and more. TIP: Other than N Seoul Tower, you can also find Palgakjeong Pavillion (octagonal hall) and Bonghwadae (beacon mounds that were used to signal incoming enemy invasions in the past). A traditional royal Korean cuisine dinner: Feast on fresh and high quality Korean cuisine set in a traditionally-styled restaurant called as Myongdongjeong. What’s more? You can also rent their hanbok for free to while eating to really feel as though you’ve been transported to a royal palace. 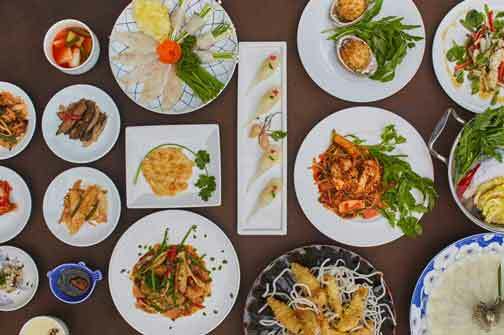 A cruise buffet dinner through Hangang River: Hangang or Han River is a major river in South Korea, and it is best enjoyed during the night with Eland Cruise as you glide through the waters and taste a delectable food buffet. Before the end of your cruise, you can even witness a firework show and a front-row view on the colorful Banpo Bridge Rainbouw Fountain Show. To reserve your spot, go here. (Nearest subway station: Jongno5(0)ga Station, Exit #7 ). Cheonggyecheon is a picturesque 11km-long modern stream that runs through a total of 22 bridges before flowing into the Hangang or Han River. Some examples of the beautiful bridges that it has is Narae Bridge (that represents a butterfly) and Gwanggyo Bridge (depicting the harmony of the past and the future). A lot of Seoulites wind down to this spot to chill and bask under the city lights, the lush ambience, and the surrounding man-made waterfalls, if not partake in the Bamdokkaebi (Goblin) Night Market from May to October — so why not do the same? I recommend that you pick up an activity that you prefer from any of the previously listed things-to-do that I’ve written under Day #2’s ‘Discover Seoul Pass’ options. If not, you can also browse through the “Extras” tab above. If you ask me, doing either a cooking class or a K-pop dance class will be a LOT of fun! Hangaram is a great choice if you want to taste some of the beloved Korean staples like bibimbap (mixed rice bowl), bulgogi (stir-fried beef), japchae (stir-fried glass noodles), kimchi (fermented vegetables), etc. Another Korean dish that you need to taste is samgyetang or ginseng chicken soup and this restaurant is often lauded as the BEST place to eat it in. ◘◘ Shop for highly discounted Korean food and snacks at Lotte Mart! (Nearest subway station: Seoul Station, Exit #4 ). 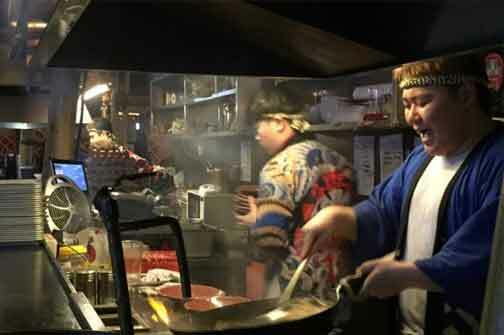 Naturally, going through any of the night markets I’ve listed under Day #1 will already grant you access to the cheapest food and snacks possible. However, other than those, I think that you should also go on a crazy chow shopping spree at Lotte Mart‘s Seoul Station Branch! Why so? Well… as one of the leading discount store chains in South Korea, they sell ridicilously low-priced goods. I swear to you, I bought about only USD$20-worth of snacks here, yet it was enough to gift them to more than 20 of people! (On top of the discounted items, you can get at most an 8% tax refund, and more to that, they also provide a free self-packing station so that you can pack all your purchased items in sealed boxes). For the must-buy snacks? It would be tteokbokki junk food, Binggrae banana-flavored milk, choco pies, yoghurt jelly, honey butter chips, fire noodles (called also as Buldak Bokkeum Myeon), Lotte stick biscuits, and honey butter almond among many others! TIP: While you’re here, don’t miss dropping by the nearby newly-opened (May 2017) sky garden walkway called as Seoullo 7017! (Nearest subway station: Gangnam Station) There’s probably not a soul in this world who hasn’t heard of ‘Gangnam’ (and we have PSY to thank for that). For your info, Gangnam is Seoul’s upscale modern center that is home to high skyscrapers, designer brands, high-end restaurants and pulsating nightclubs — so yes, it’s the home to many wealthy Koreans. In fact, you can think of it as the ‘Beverly Hills’ of Seoul. To make the most of your visit here, stop by the following (it’s best to pick 3 at most). Gangnam Terminal Underground Shopping Centre: You’ll find this from the moment that you step foot in Gangnam Station’s subway. With an array of accessories, clothing, cosmetics and shoes, I have found a lot of sweet bargains here myself! Gangnam Square: Right outside Gangnam Station’s Exit #5 is the spacious Gangnam Square which has a small section built as a tribute to PSY’s ‘Gangnam Style’ hit song, as well as the Gangnam-daero Road that’s speckled with variety shops. Apgujeong Rodeo Street and Cheongdam Fashion Street: (Nearest subway station: Apgujeong Rodeo Station, Exit #1 and Exit #3 respectively.) If you haven’t had enough of shopping but are looking for more upmarket shops. Hallyu K-Star Road: K-pop fans must not skip on this! Found between Apgujeong Rodeo Station and Cheongdam Station are adorable GangnamDols that are each autographed by K-pop groups like EXO, BTS, Super Junior, and more. For a detailed list, you can check here. This Gingko tree-lined street is a popular, trendy street in the city of Seoul and it is even often called as ‘artists street’ due to the number of quaint cafes and designer stores. Some charming cafes that you can choose from are Gingko Avenue, Line Friends Cafe, Cafe de Paris, and IKOVOX. This mall is a shopping mecca, but more than this, it has interesting amenities too that are not limited to the COEX Aquarium and the Starfield Library. The latter is the newest built facility in the premises and it features 50,000 books and magazines in a grand yet relaxed setting. This place is dedicated to famous K-pop artists under the powerhouse of SM Entertainment in South Korea. Avid fans can tour through their training rooms, recording rooms, and so much more. (If you don’t have the pass and want to separately book a ticket, go here). As Seoul’s largest indoor and outdoor amusement theme park, you will actually need a full day to enjoy this place — but I still felt like including this here, just so you know that it’s located in this Gangnam area. So if you have a spare day, it would be great to visit Lotte World. 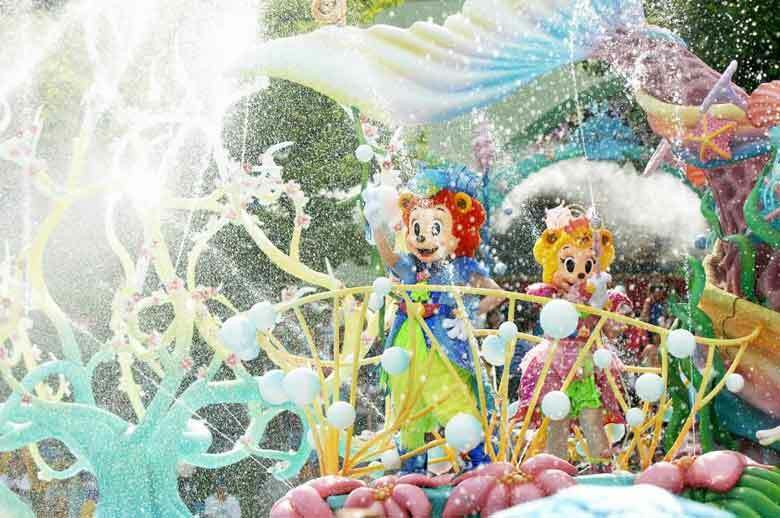 Another theme park choice would be Everland, but if you want other options, check the “Extras” tab above. Towering at 554 meters, this new 123-floor skyscraper just opened last April 2017 and it is currently the tallest building in Seoul and the 5th tallest in the world. It contains several cafes, galleries, a luxury hotel, a skywalk and an observation deck. Obviously, this is the best place for viewing panoramic views of the cityscape and I highly suggest that you go up to the observatory not only to enjoy the view with a cup of coffe, but to also experience its glass floors! Though it was nerve-wracking at first, it was really cool to feel as though I was floating up in the air like that! 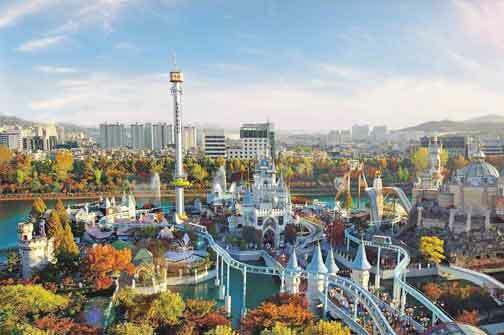 (Another thing you can enjoy nearby is Lotte World Mall). I think it’s time to have a meal with the guidance of a local, so why not try a Seoul street food tour for instance? If you’re not game for that, you can find other food or restaurant options under the “Extras” tab on top of this section. It’s no news that the Korean peninsula has long been divided into the two countries: North Korea and South Korea. Unfortunately, it was not at all a peaceful separation given the infamous 250km-long buffer zone of the Demilitarized Zone (DMZ) that separates the two since 1953. Today, it is referred to as the most heavily guarded area in the world with battle-ready armies, fences, landmines, and fences on both sides — it’s absolutely one of the scariest place in the world! …And yet, it continues to be a popular major tourist attraction in South Korea that attracts a lot of history buffs and curious folks worldwide who are seeking to witness this surreal land for themselves (people like me). Bridge of Freedom: Where South Koreans have crossed when they were released from North Korea. You will witness a lot of ribbons tied to the fences that each contain messages of hope, peace and love. Dora Observatory: From here, visitors can look closer into North Korea with binoculars as they witness things like the North Korean propaganda village, Kaesong city, and others. Dorasan Station: This is the northernmost train stop on South Korea’s railway line and locals hope that it would one day connect North and South Korea when peace finally prevails. It is possible to combine the two tours above for a whole day experience, but since I visited in April 2018, the JSA tour was no longer being offered — nevertheless, the DMZ tour that I’ve done to the Third Tunnel of Aggression still proved to be such an amazing yet surreal experience (not to mention that our tour guide was beyond amazing given how she provided a lot of interesting history and explanations). After your tense morning tour to DMZ, how about you relax and pamper yourself with Korea’s well-liked spa services? Apart from getting a Korean massage, I urge you to experience jjimjilbang or a large gender-segregated public bouth house complete with hot tubs, showers, traditional Korean kiln saunas and massage tables. If you’re a fan of K-dramas, you will probably be familiar with this because it’s a common place that Koreans frequent for spa services. For this, you can visit Dragon Hill Spa (or if you hold a Discover Seoul Pass, it gives you free admission to Sealala jjimjilbang). ALTERNATIVE: If you rather want to relax in nature, go over to the World Cup Park, a humongous space that used to be a landfill but has now been turned into a park with 5 different sections: Pyeonghwa (Peace) Park, Haneul (Sky) Park, Noeul (Sunset) Park, Nanjicheon Park, and Nanji Hangang Park. A crowd favorite would be Haneul Park as it’s the highest elevation of the five parks. Buffet: Taste all kinds of gourmet food at 63 Buffet Pavilion, South Korea’s biggest buffet. Korean gopchang: Taste the popular stir-fried Korean dish made up of small intestines from cattle or pork (often best paired with soju) at Aunt’s Grilled Intestines Restaurant. It’s time to venture out of Seoul’s busy metropolis to get some fresh air and tranquility. 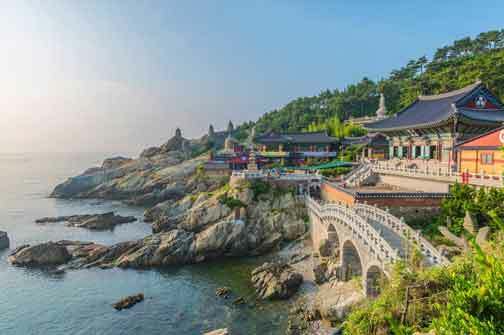 For this, a day trip to Gapyeong County’s top attractions is recommended! » READ: My detailed guide on this tour by clicking [here]. Petite France: This is a charming place that serves as both a cultural village and a youth training facility with over 16 French-styled buildings. Petite France is also recognized as a top filming location for Korean dramas like ‘Secret Garden’ and ‘My Love from the Star’. With its European ambience, it is also somewhat of a tribute to Saint-Exupery, the author of the famous French Novel: ‘Le Petit France’. Nami Island: A half-moon shaped island nestling inside an artificial lake known for being the filming grounds of the well-known K-drama ‘Winter Sonata’. Nami Island is home to rows of majestic trees, roaming animals, and art exhibits, making it a sought-after destination in every season! I highly recommend that you rent a bike when you’re here; otherwise, there are other activities you can do such as doing water sports, trying on the roller skating rink, going on the shooting range, and more. Garden of Morning Calm: This grand 30,000sqm garden is open all year round and it is regarded as the oldest private garden in Korea with an artistic space that’s sure to leave anyone in awe. The Garden of Morning Calm becomes even more magical during winter (December to March) when they set up hundreds of multi-colored lights to create themed gardens, so make sure that this is on your Seoul itinerary! Gangchon Rail Bike: Built on a discontinued trail line, Gangchon Rail Bike is a fun attraction where you can pedal through old railroad tracks while taking in the amazing Bukhangang River scenery. Rest assured, it doesn’t require much effort to pedal the makeshift carts because the rail lines are slightly slopping downhill. Edelweiss Park: Edelweiss Park is similar to Petite France, but instead, it focuses more on being a Swiss-based cultural village, so it’s filled with Swiss architecture, establishments, and sceneries. Samgyeopsal: Taste this hearty grilled pork belly dish at Palsaik which is very popular with locals. Jokbal: Try this Korean dish consisting of soft pig’s trotters cooked in soy sauce and spices at Manjok Ohyang Jokbal. 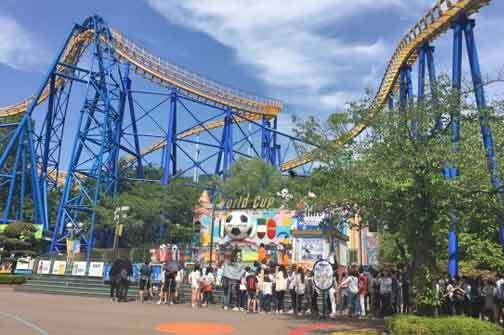 South Korea’s largest attraction park. Large indoor and outdoor theme park. 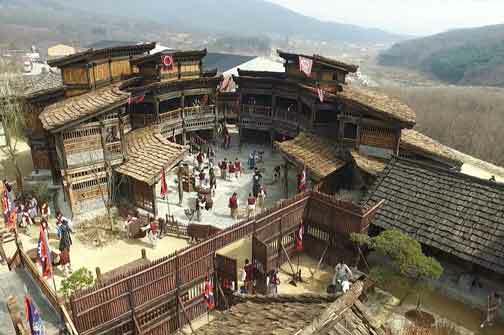 Largest historical drama open set in Korea. Learn popular K-pop dances and choreography. Visit K-drama Goblin’s filming sites. Backstage access to live sets and broadcasts. Record your own K-Pop song at King Studio. Day rental experience of a Korean school uniform. Action-comedy show full of stunts. One of the best Korean musical shows. Famous live painting non-verbal performance. 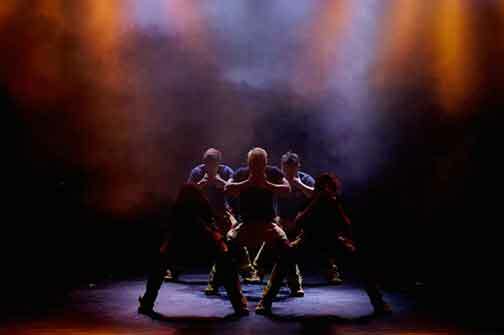 Seoul’s favorite martial arts theatre show. Full makeover at a famous studio. Go through an amazing photoshoot with your friends. Pre-nup shoot complete with makeup, hair, and clothes. 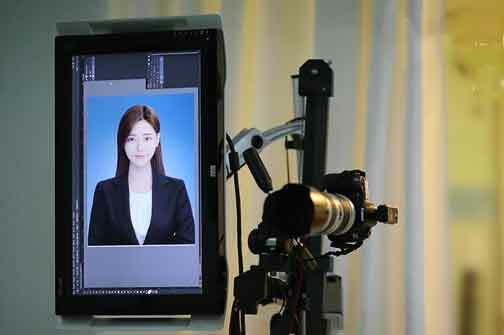 ID shoot in Korean style makeup and hairstyle. Style your hair in Gangnam’s top salon. Cook authentic Korean dishes with a local. Create your own signature scent. Create your own unique accessories! 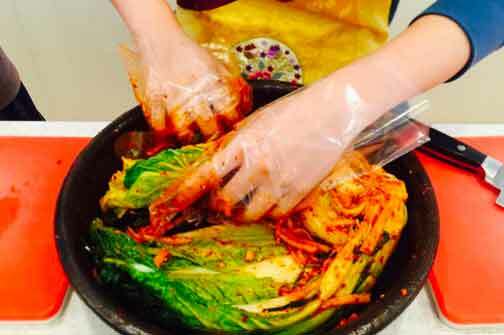 Learn how to make kimchi and topokki! Create your own ceramic doll as a souvenir. 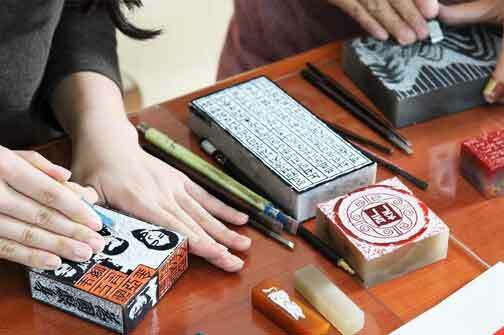 Create your own Korean-style hand engraved seal. 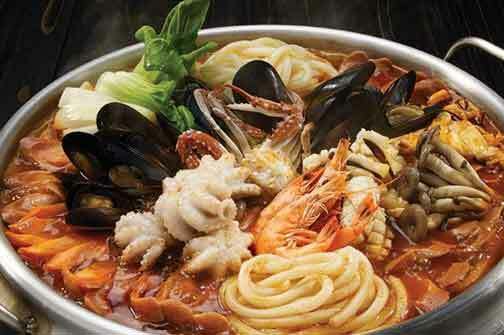 Try budae jjigae, the iconic Korean ‘Army Stew’. The first puffer fish restaurant in Seoul. 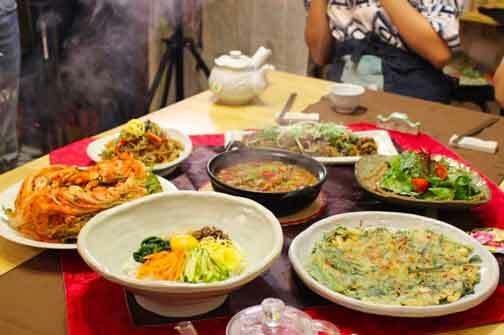 Experience Korean eating and drinking culture! The perfect dessert at a great value. 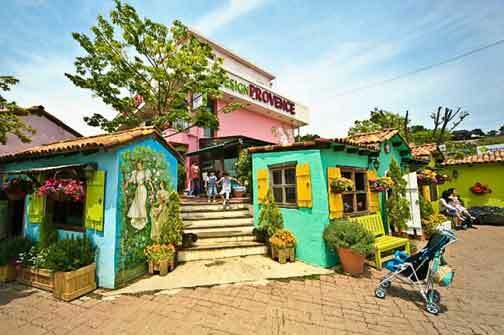 Known for its bibimbap and heritage village. Experience the best of Busan. 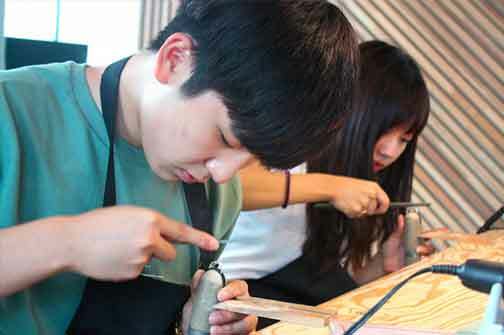 Discover Paju City, Korea’s art hub. There’s still so much to see in Seoul! …But I believe that my travel guide here is already a good start. Please feel free to tweak this itinerary and make full use of my extra activity suggestions in order to make your trip shorter or longer and better fitting for your travel style. Enjoy and do let me know how your trip goes! What do you think of this Seoul itinerary? What are the top things that you would LOVE to do? Or have you already been to Seoul? How was it? Any other travel tips to add? Hi! Very helpful blog you have here! Want to try the hanbok. But is it not too heavy to wear from the palace to bukchon to insa-dong? And is it not too much of a hassle to return the hanbok to the rental shop after going around the said places? Thanks! Thanks! And no, I didn't really have much difficulty with it. There is some weight but not the kind that will make it hard to walk :) Otherwise, you can always take a bus or taxi to get to a place you want — it's normal for the locals to see tourists in hanbok anyway :) If you also time your stops, then it should not be a problem. Just pick the top places you want that I listed above and then use Google Maps to see the travel time between them. Hi! I am a first time traveller. I would like to ask if you availed both the T money card and the Seoul Pass? Or can I just get the Seoul Pass nalang since it can also be use as t money card if i am not mistaken.